Patriotic Programs & Services are listed below. Programs range in duration from 10 to 50 minutes and are scalable to meet specific time constraints. 1. 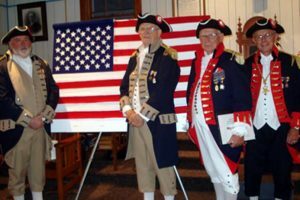 Building-the-Flag – Sojourners in colonial uniform explain some of the flag’s special features, and answer many intriguing questions about our Flag as it literally takes shape stripe by strip and star by star before your very eyes. And, . . . if you listen closely, . . . you will even hear a beautiful soliloquy known as “Old Glory Speaks.” This is a wonderful program for those of all ages and particularly the youth of our Nation to gain new insights about the flag to which we are so privileged to pledge our allegiance. 2. Historic Flags – From banner to battle flag, Sojourners in colonial uniform parade and tell the story of some 15 historical flags which played a vital role in our country’s heritage. 3. Folding-the-Flag – The Folding the Flag Program, conducted by Sojourners in colonial uniform, is designed to provide instruction on how to properly fold the flag. During the program, the meaning of each fold and the final triangular shape is also explained. 4. Toast to the Flag – The Flag holds a very special place in the hearts of all Sojourners, and this feeling finds no better expression than in our Toast to the Flag. Sojourners are often called upon to assist in the patriotic openings of youth events and regularly offer The Toast at other like events, which pays tribute to the RED, WHITE, and BLUE of our National Ensign. Here is an example of this presentation. 5. When Duty’s Done – This moving ceremony, also conducted in our colonial uniforms, teaches and demonstrates the proper method for retiring and disposing of US Flags that are tattered, soiled, torn, or no-longer serviceable. 6. Custom Services – Custom Services includes uniformed (usually Colonial uniforms and in some instances US Military uniforms) Color Guards for parades, flag pageants, civic events, historic celebrations, Masonic event openings (Lodge Installations and Grand Annual Communications) and other national patriotic observances of our American heritage.